Here are some bathroom styles that are already popular in 2015: Designs of small, yet stylish, low-maintenance master bathrooms with sustainable style. 1. Feature floor tiles. 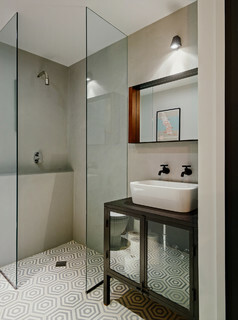 Concrete floor tiles in a graphic geometric pattern work well in this minimalist contemporary bathroom above. 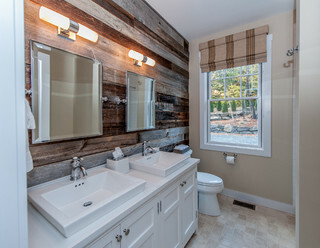 The vanity also fits the trend of sustainable style, as it was crafted from a recycled cabinet. Plant life. A fabulous vertical garden is shown above. 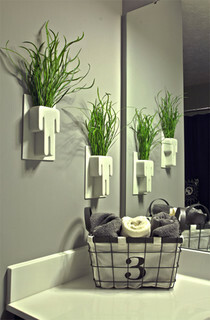 The plant-life trend also references “cascading creepers.” For a low-maintenance, inexpensive alternative, a rosemary topiary; an orchid; a big, fat fern on a stand; or wall vases like the ones seen here can bring the green into your room with ease.